DIRECTV Caribbean are moving from Galaxy3C to a new satellite, Intelsat 30 also known as DLA-1, which is colocated at 95.1W. The new beam only covers the Caribbean and does not include Florida or Central America. This gradual migration is apparently happening now, at the end of October 2016. This will be quite a limitation for yachts that have relied on this service outside the Central Caribbean. This will also rule out setting up the receivers in Florida before leaving for the Caribbean. From what I understand, the new service will use the same LNB and satellite recievers, and the transponder frequencies will remain the same. So no action should be required by the vessel crew. Hopefully the good tracking parameters of SAT 95W, FREQ 1070 BAUD 22500, VOLT LHCP, TONE OFF, FEC AUTO, NID 0000 will still work on the new satellite. Please let me know if this has changed. Information on this development is scarce, and I will update as information materializes. If anyone can provide updates or first hand experience with the new beam, this will be appreciated. There are two beams carrying DIRECTV Caribbean signals; DLA-1 Region 1 and DLA-1 Region 2. Both are on the same satellite at 95W. From what I have been told, all channels will be present on DLA-1 Region 1 and Region2 will have a repeat of some, but not all, of the same channels. I pieced the following map together based information from Satbeams.com for the IS30- R1L and R1R beams, also known as DLA1 Region1, but I cannot vouch for it's accuracy and it should be used only as a rough guide. This is based on Satbeams.com IS30 R2L and R2R. From what I have been told, all channels will be present on DLA-1 Region 1. Region2 will carry some, but not all of the same channels. The DirecTV Latin America (DLA) sometimes refered to as GLA for Galaxy Latin America, is a dual output, circular pol LNBF with a local oscillator frequency of 10500 MHz. Both ports on the LNB are capable of putting out either LHCP and RHCP ( Left and Right hand circular pol) bands depending on the signal voltage (13V/18V) applied to the coax from the multiswitch or receiver. Unlike the european Linear LNB, where each port is dedicated to a particular pol, it does not matter which coax connects to which port as long as you use both low band coaxes (on Seatel blue and white). If the port receives 18 Volts from the multiswitch,it will put out LHCP signals, and if it receives 13V from the multiswitch it will put out RHCP signals. ﻿Note that the GLA LNB has a spacer ring, often refered to as the "wedding ring", which must be inserted into the feed before the LNB. This spacer is only required for the GLA LNB, but is often left in place when changing to US or Europe LNBs. Marine subscriptions for yachts and other vessels are now handled by DirecTV in Trinidad. Receivers are available from Trinidad at a cost of about $150 for the standard definition L-14 and about twice that for the HD DVR (LHR-22). Note that HD reception may not be available everywhere in the footprint. I believe that it is only in the area around Puerto Rico. So you may not need to get the HD receivers, unless you require the DVR capabilities. To view HD, you need to connect the receiver directly to the TV with an HDMI cable. If the receivers are colocated in an AV locker with composite video distribution, the tiny L-14 receivers should be quite adequate in most installations. The L14 Decoder is tiny, and easy to install. This is only for Latin America (Caribbean). The L is for "Latin"
It has an adapter cable with composite video out to the TV (yellow) and left and right stereo audio (red and white). It comes with a standard DirecTV remote control. Most of the TV channels on 95W for Latin America are in standard definition, so there is no need to purchase HD decoders, unless your TV display will not accept a standard composite video input, or if you want the DVR recorder function. Some vessels purchase one or two DVRs for, perhaps for the owners suite and the salon, and the rest of the decoders as standard definition L14s. Despite their tiny size, these decoders have been shown to provide perfect results. The LHR 22 is only for Latin America (Caribbean), the L standing for "Latin". I do not know if regular HR22s will work in the Caribbean. This is a regular high definition digital video recorder with two satellite inputs so that you can record one show while watching another. The output to the TV is HDMI, Component (not composite) and S-Video. 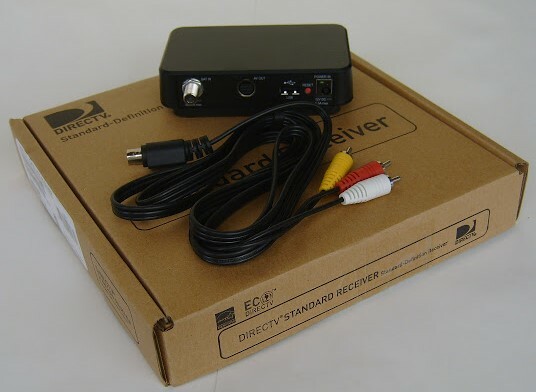 Since there is not much HD content in the Caribbean, you would only need this decoder if your TV did not accept a composite input from the standard definition L14 decoders, or if you required the DVR function to be able to record shows. Subscriptions are sold in packages of two receivers per account. For the basic package of about 67 channels, the standard definition subscription for the first receiver costs about US$408 for the season and the second receiver is $120. Additional pairs of receivers are purchased in separate accounts for the same cost of $408 for the first and $120 for the second. For high definition the subscriptions are $480 for the first and $192 for the second receiver of each two receivers. This is an annual charge. You can add premium channels like the HBO-Max package or sports package for $10 per month. Much of the programming is in English, but since this service is targeted a Latin America you can expect to have Spanish commercials, program guide and subtitles on many of the programs. Most documentation shows the BAUD rate on the standard def channels as 20000. I found that changing BAUD on 1039 to 22500 it will decode the NID of FFFE. 91136 visits to this page since 28 Nov 2012.